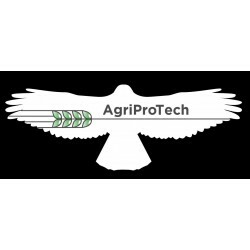 AgriProTech bird scarer kites are designed for bird control. Made for professional use, they are easy-to-use and cost-effective. 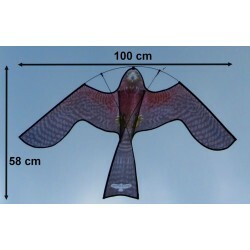 Bird Scarer Kites - Visual deterrents There are 9 products. Kevlar line + swivel adapted to FlyTrac kites. 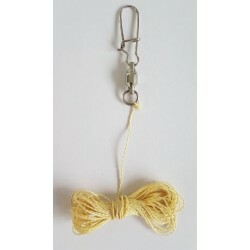 Average strength: 50 kg Imputrescible and non-flammable Length: 5 meters Diameter: 0.25 mm Color: yellow Staple swivel with integrated rolling, prevents the line from twisting. 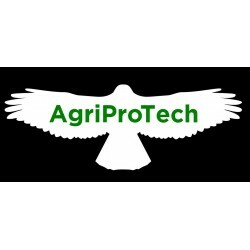 AgriProTech scarecrow kite for professional use. Made in France. Efficiently repels: Pigeons, Crows, ravens and other corvids, Starlings, swallows, Gulls ... Covers up to 2 hectares / 5 acres. 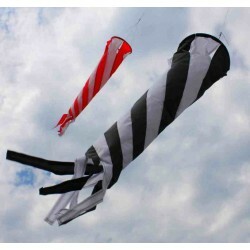 This bird repellent windsock kit can be installed near many potential target, such as: fruit trees (cherry trees, plum trees), small fruit plants (to protect strawberries, raspberries ...), vegetable gardens small plots ponds ... 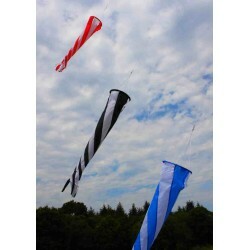 These colored windsocks create movement, perceived by pest birds as a threat. They will not approach it! Scarecrow kite for professional use. Made in France. Efficiently repels: Pigeons, Crows, ravens and other corvids, Starlings, swallows, Gulls ... Covers up to 5 acres. This set includes a 5-meter telescopic pole.